The yacht Frantic in trouble off the south eastern side of Grassy Island. 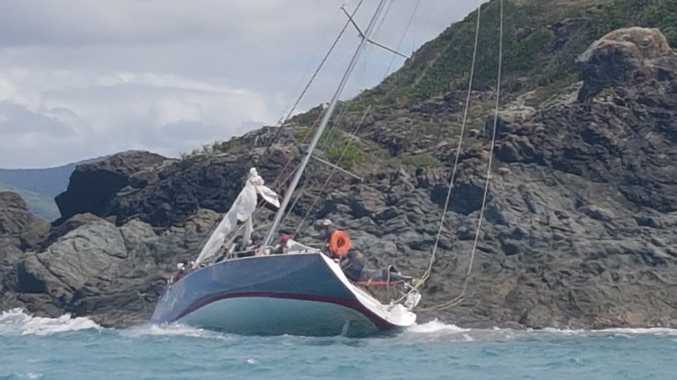 A horror end to the 27th annual Airlie Beach Race Week for the crew of Frantic got worse this afternoon as efforts to recover the stricken boat failed. After hitting rocks at the south eastern end of Grassy Island yesterday afternoon, eight crew members were rescued by Ocean Affinity and taken to the Port of Airlie Marina. Frantic skipper Graham Furtado said salvage efforts today had been impossible because the boat was not in the same place where she was abandoned yesterday. Frantic is a Sayer 40 and is sailed out of the Royal Queensland Yacht Squadron in Brisbane - she was a competitor in the Pittwater to Coffs Harbour ocean race last year. Furtado would not comment on the area on which the search had focused so far, but said this afternoon "we are still looking".